Today we have a striking collection of 9 Victorian Ladies with Stylish Hair and Clothing – Free for you. The Victorian Era was one of understated opulence. Therefore, Victorian Ladies made a statement with their clothing and accessories. 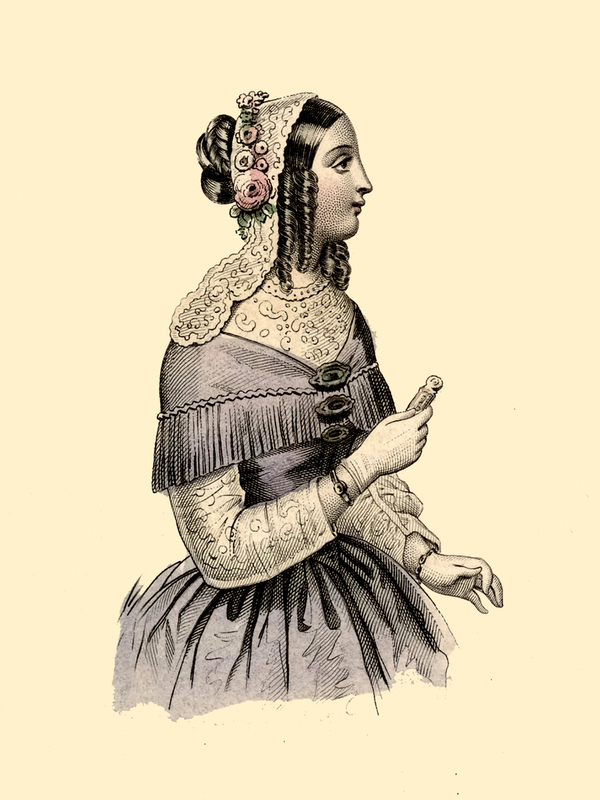 Their hair was almost always bedecked with combs, flowers, or a jeweled ornament. When going out, they wore elaborate hats embellished with lace, feathers, and veils. Hats had to be fairly large in order to accommodate for large updos. It was a fascinating time and we have the images to illustrate it. Our Stylish Victorian Ladies would be perfect to use in a Victorian Junk Journal or nice to use for Fashionable craft projects! 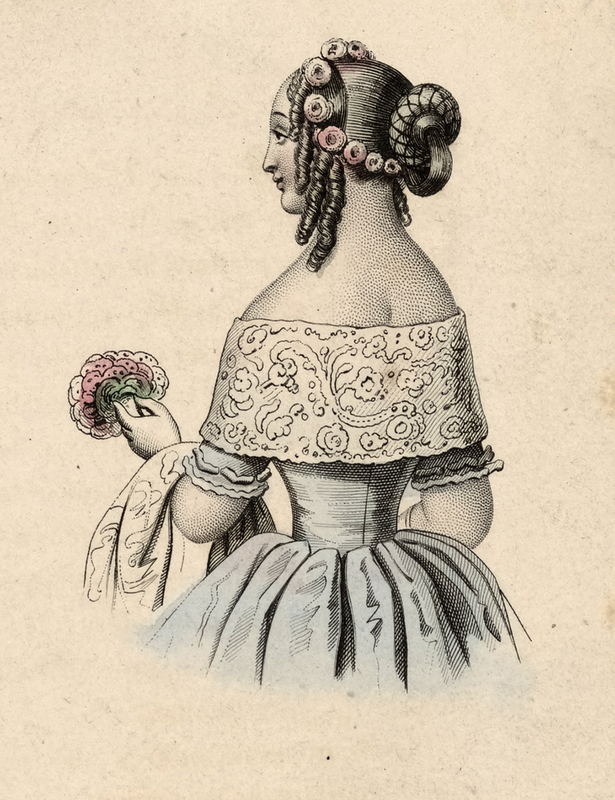 Above we have a Vintage Image of a Victorian Lady with a Twisty Spiral Updo and long Ringlets that hang down on either side of her face. We see her from the back in this drawing. She wears several Pink Flowers in her hair and the spiral is accented with a Gold oval ornament. Her off the shoulder gown looks like taffeta or moiré because is undulates pinks and blues. There is cream lace at the sleeve collar edge. She is standing with her back facing towards us and is wearing gloves. 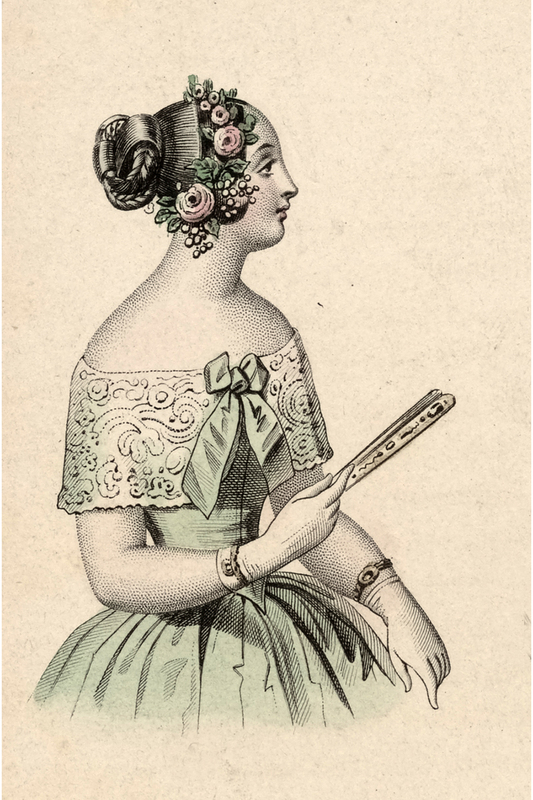 Similarly, seen above is an Elegant Victorian Lady Holding A Fan with pink roses in her hair. Her striking updo, collected at the back of the head, is complemented by braids woven with unbraided hair. It must have taken quite some time to accomplish this elaborate Victorian Hairstyle. Several pink roses in graduated sizes are an added flourish. You can see tracks where the combs pulled through. Amazing. Her dress is pale green silk and has a wide cream lace ‘Bertha’ held in place by a beautifully tied green bow at front. It has a dropped neckline just below the shoulder. Here we have another Pretty Victorian Woman wearing flowers in her hair. She is holding a Tussie Mussie Bouquet of Pink Flowers! 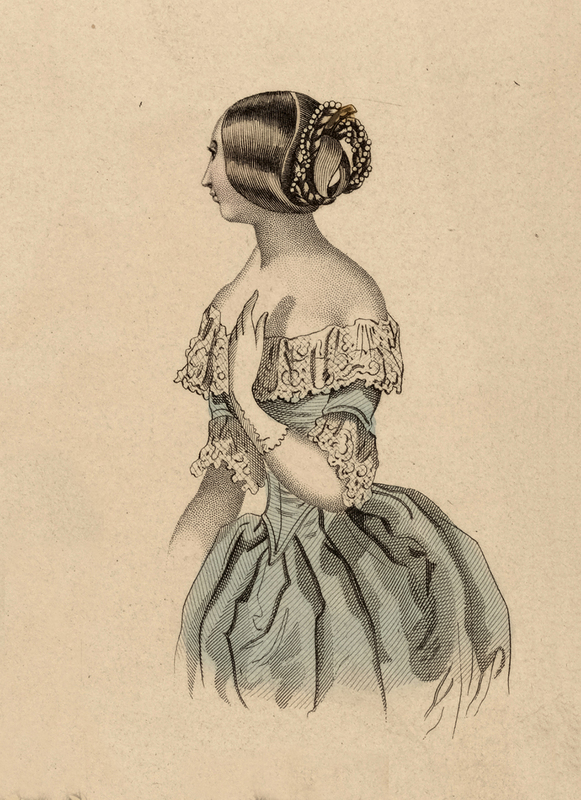 Her hair is worn in a woven updo collected at the back of the head in a black net. The chignon is complemented by several graduating ringlets of hair leading from the front of the hair to just behind the ear. She wears a powder blue gown with a slim waist and voluminous skirt shown from the back. The low neckline is accented with a scrollwork Bertha and a matching chemisette over her arm. As a result of seeing all the features, I think perhaps she is a Bride! 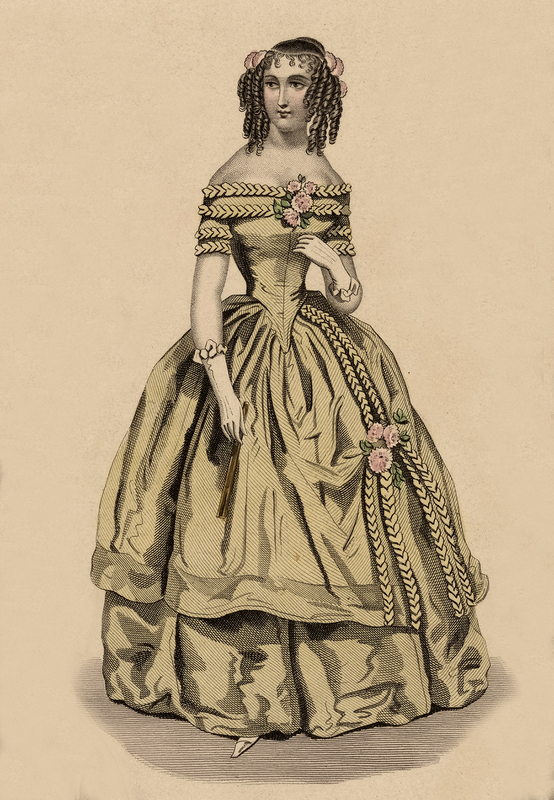 Above we have an elegant Victorian Girl in Stylish Gold Gown with Pink Flowers! This is our only full length Victorian gown picture. The gown features a skirt and overskirt of light gold silk. The volume and width of the skirt is stunning with rows of braided trim and flounces and a tiny bouquet of pink roses. In other words, it is magnificent! Fancy ringlet curls hang at the side of her face as a braid-crown barely shows at the top of her head. I love the curly fringe on her forehead. She also has pink flowers at the back of her head. Shown here is a lovely Victorian Girl with Braided Chignon! Her glossy hair is parted down the center, looped around the sides, and secured in the back by a braided updo. Her Stylish Clothing features a dropped neckline with ruffled lace over light aqua blue satin or silk fabric. The skinny waist is accented with a long inverted triangle bodice over an enormous billowing skirt. In conclusion, I offer only two words: Simply breathtaking! 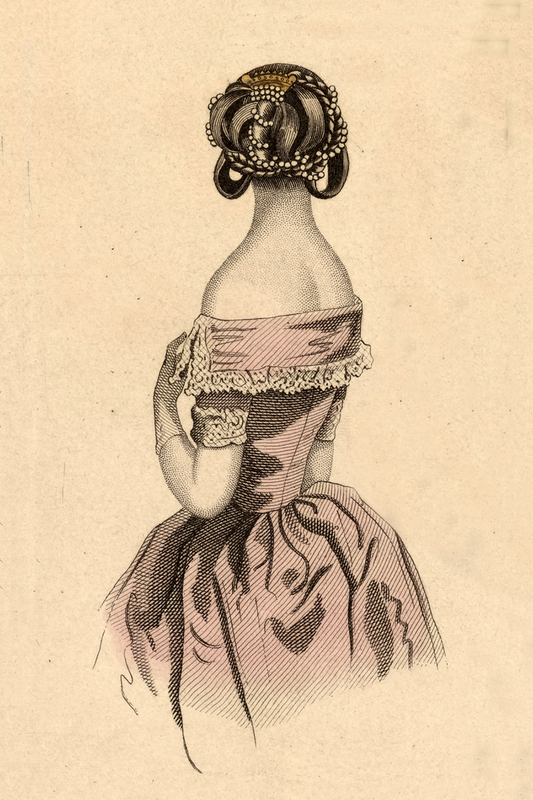 I adore this Victorian Lady with Looped Hairstyle and Pink Gown! Isn’t this an opulent hairstyle? For instance, her long hair is looped like a sash around the sides and woven into braids and beads in back. The updo is held with a golden crown comb. A light rose pink moiré gown hugs her upper torso. A wide, puffy skirt flows from her tiny waist. There are lace accents at the short sleeve and drop neck. This Gorgeous Victorian Girl in Lilac Gown wears a flower Decorated Lace Headpiece. The lacy headpiece has overly long sides, which hang onto her shoulders. Pink roses surround the top. Her dark hair is gathered into a loose, braided chignon in back with lovely ringlets on the sides. Her pale purple dress and Bertha are worn over a long sleeved lace top. It looks as though she is holding a fan in one of her hands. 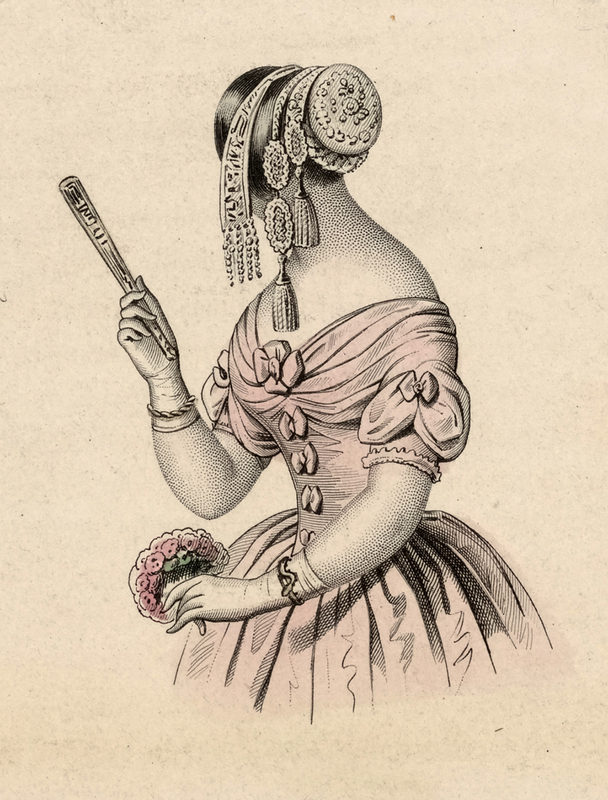 This is a lovely Victorian Lady with Tassel Headpiece and Pink Gown. 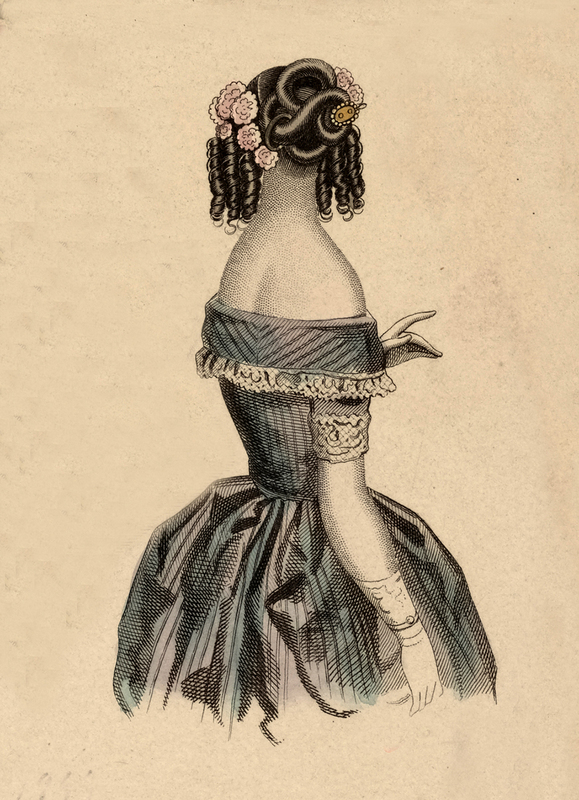 This Hair Covering is over the top with tassels and embroidered (maybe even jeweled) stiff circle cap and long side pieces hanging by her face. I believe this might have been a bride because hats were more elaborate for this occasion. This one is certainly splendid! Her gathered pink gown has bows going down the bodice. She is holding delicate fan. Lastly, we have a Demure Victorian Girl Wearing a Bonnet and Carrying a Handkerchief Image! 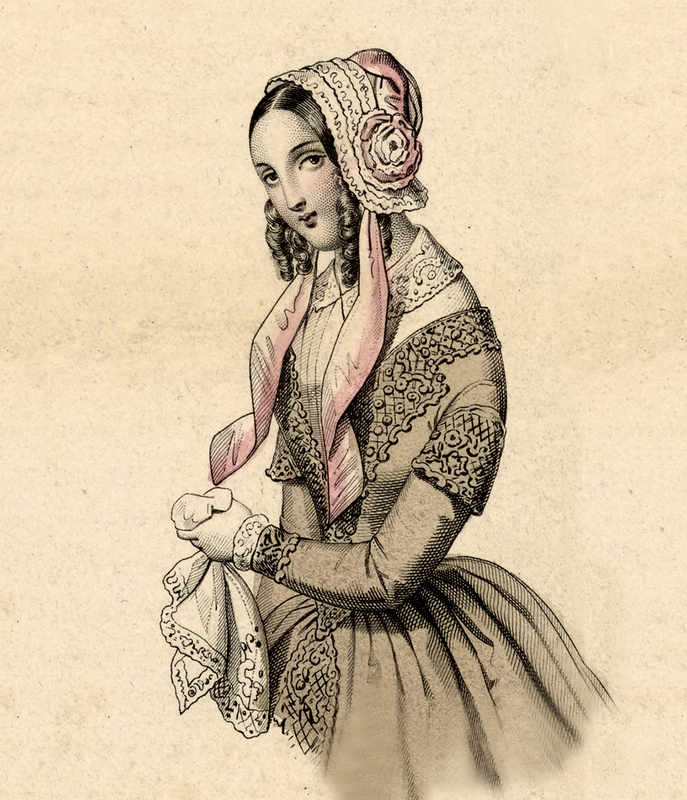 Her Lace Bonnet features large pink ribbons untied over long ringlets. She wears a sepia tone dress with low V-shape neckline over white a chemisette to cover her bustline. There is a bustle visible in back. I hope you enjoyed this curated collection of 9 Victorian Ladies with Stylish Hair and Clothing – Free!! You might also like our 10 Free Mother’s Day Images HERE or our 50 Best Free Gardening Images HERE! 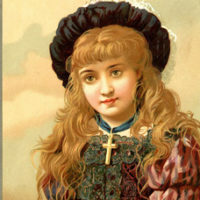 14 Victorian Ladies with Signs – Labels 11 Medieval Lady Images and Costumes! 2 Edwardian Ladies Fall Fashion Plate Images! « 8 Vintage Eiffel Tower Clip Art! I am so happy to hear that Maxine, thank you!! I loved the faux dresden video. Thanks so much. Hi – just thought I’d share a tidbit for you, as an ex-costume designer – these are Edwardian clothing and hair fashions, not Victorian. Think Jane Austen and not Charles Dickens. The picture’s are beautiful. Thank you for sharing.